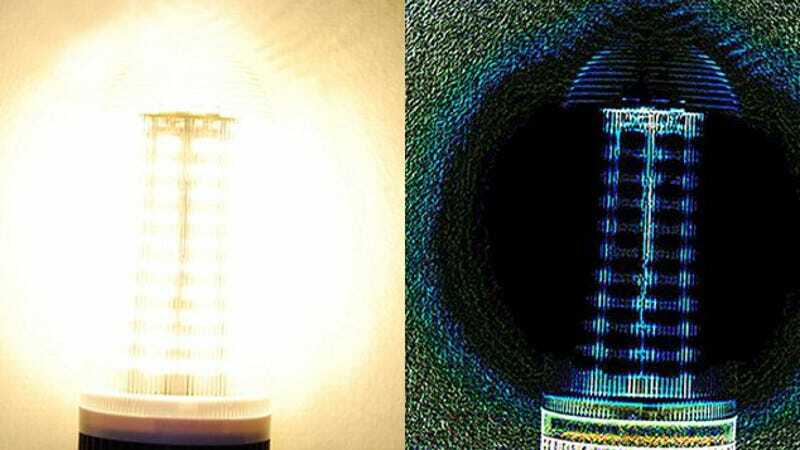 An LED light (left) and what it looks like processed with the new algorithm (right). You shouldn’t always believe your eyes—because there’s much out there that you can’t see. A new, free algorithm created by UCLA engineers enables you to discern details in images that would be impossible to observe any other way. Originally developed for high-speed image processing of cancer cells in blood, the Phase Stretch Transform algorithm identifies edges, extracts features and enhances textures to reveal details that the human eye can’t. So in the image above, it allows you to see the details of an LED that are otherwise drowned out by the light it produces, while in the image below it makes it easier to see distant stars. The moon (left) and a view created using the new algorithm (right). The team hopes that its newly available code could be used for a variety of different applications: Face, fingerprint and iris recognition, for instance, or in the image-processing software of autonomous cars. You can download the code from Github or Matlab File Exchange now.